NEWYORK. As part of my collaboration with mytheresa.com I’m alo doing guest edit on their site featuring some of my favorite pieces for fashion week (check it out here). This stunning Stella McCartney coat was on top of the list and you have no idea how much it hurt to send it back after the shoot. It’s quite possibly the perfect piece for spring!! And speaking of perfect pieces, there’s still one day left to enter the fashionsquad x mytheresa giveaway where you can win the amazing Alexander Wang bag from this post, go, go, go! This entry was posted in Fashion Week, Outfit and tagged Alexander Wang, fashion blog, New York, nyfw, stella mccartney by Carolina Engman. Bookmark the permalink. Haha, I agree with you must have been a very sad moment sending back that beauty! Love this look, the coat is gorgeous! AMAAAAAAZING! That coat is stunning! coming to london fashion week? lovely coat! reminds me a little of mary katrantzou… maybe because of the multicolored pattern! wow perfect spring coat! love your blog, have named my Kurt Geiger clutch after you! shame you have to give it back cause is an amazing coat to wear in spring it would be better if they could just give you the coat . such an awesome coat!!!! LOVED FOLLOWING YOU THROUGH NYFW!!! love instagram!!! love to win that bag!!! You look stunning! Head to toe. I love the coat. It’s so fun, especially for winter. Amazing coat! Your whole look is great! The bag is so fab! This coat is amazing! Such a standout piece. you look SO beautiful as usual carolina! that stella mccartney coat is incredible too. the print is insane! Absolutely lovely!!!! Those shoes are to die for! Your coat is so great! It looks awesome..
Great photos… Love the bag! Wauw, that coat is indeed amaaaazing!! graet prints and colours! Bag have perfect shape, I really like this look is so chic! You look lovely! Love the floral blouse! Wow! That coat is pure perfection! Such an inspirational coat. So unique and the coat is beautiful. I am dying for this outfit. That coat is incredible. Having serious bag and shoe envy right now! Of course it hurt to give this away, it’s INCREDIBLE! LOVE!!! ahhh the blue! it’s so pop! and the prints! I’m in love with your coat – it’s everything! you look so chic with blue !! perfect! love the coral, sea-blue colours running through this whole outfit. Amazing coat! Love the print and it really looks great on tou. Can imagin in hurts to send it back ;) Still in love woth the bag! gosh. i adore your photos! love the alexander wang bag!!! this outfit is super stunning. 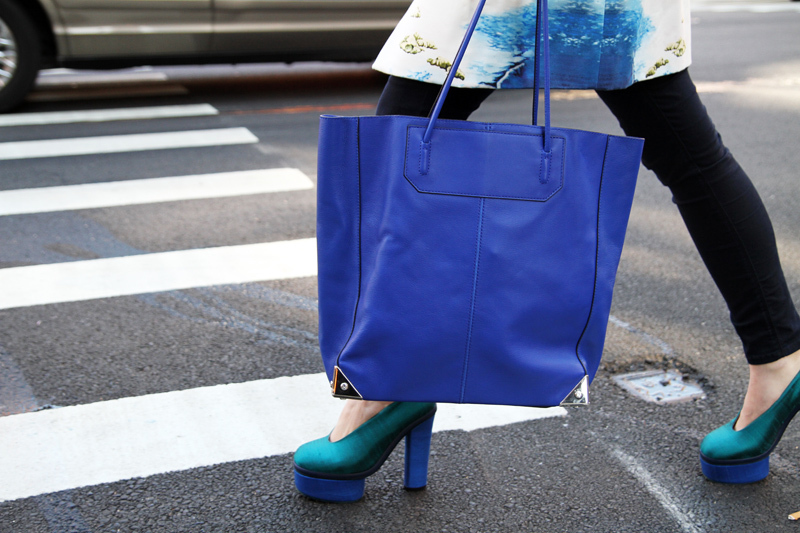 love the blues and especiallz that electric blue bag. and how fun is that coat. this is my fav ny outfit so far! omg! the coat! love it! kisses and a wonderful weekend to you! The whole outfit is perfection!!! Oh I love that Stella McCartney coat!!! Stunning!!! Love, love, love! The bag and blazer are great and I adore the shoes!! Wow, love the different hues of blue with a black touch. I have also gone into a blue period and everything in blue catches my eyes:) Love this look of yours!! Is so beautiful this bag!You look great! The coat is out of this planet! I love it! Just two words: Perfect and im totally in love! I love mainly aqua shoes by Acne, but as blue is my fav colour, I’ll go for this floral coat as well. Lovely set of photos in the streets of NYC. I hope, you enjoyed your trip. Love that coat. And that bag! Definitely one of the nicest outfits I’ve seen in a while. Meencanta el abrigo y los zapatos!Son realmente bonitos! this coat is sooooooo gorgeous ! Absolutely in love with this whole look, and especially with the Alexander Wang dream bag, fantastically gorgeous! I’m in love with the coat! It’s gorgeous! You’re soo beautiful. WANT your bag! You look fabulous! I especially love the shoes + sunglasses! I loooooove those shoes…they’re amazing!! Great look!! Love the Acne shoes! Check out my latest post about Fashion Week. Don’t send it baaack! 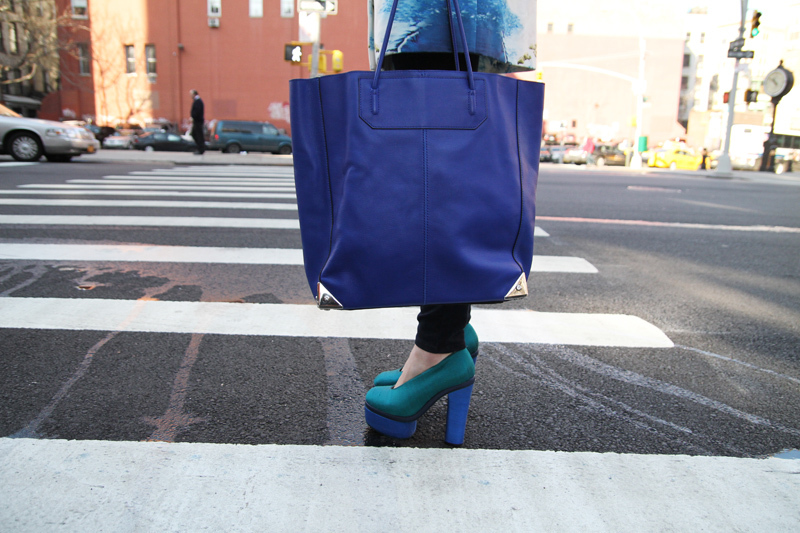 :-) Looove the shades of blue,the shoes are killer!Keeping my fingers crossed for giveaway! So sweet with this light blue color! You look gorgeous, I love your coat! Oh wow! I love love LOVE ur outfit! The coat’s just way too perfect! owow, you’re looking just PERFECT! You look lovely! What an incredible jacket and beauitful bag! omg i love your coat so much! woooow, those heels are absolutely amazing! Oh my… that coat. You look like a tropical bird in the middle of New York – rad. wow you look fabulous! great shoes and i love the coat! Wow! The coat is just gorgeous and I absolutely ADORE the shoes too! This outfit is chic, sophisticated and extraordinary at the same time! Your blog is an inspiration to me! You look fabulous! I love your coat and bag so much! Guauuuu Guauuuuu Caro, great Jacket and great pics with you hair in wind. This look is absolutelly perfect! I mean, you look perfect! Congrats for this gorgeous blog cuttie! Fabulous shades! And they do make a great addition for spring! Beautiful color combination. Must have those colorblock shoes! Love the print in the coat! Love the coatr and the bag!!! I would so kill for that coat! It’s absolutely beautiful. It’s the perfect printed jacket for sure. Oh my god.. This outfit is soo cool! I really love the blue colours and the coat…wow! I adore blue hues at the moment. LOVE the bag, OMGoodness I must have one now. Great post, amazing outfit! 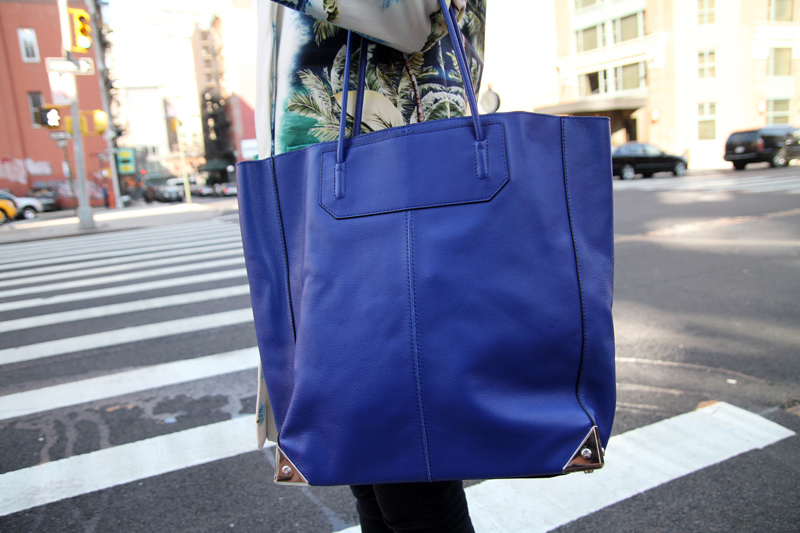 The coat is brilliant, and the exquisite blue Wang bag amps up the color even more. Electrifying! I ADORE Alexander Wang and I’d be more than happy to win this bag <3 :)) !! 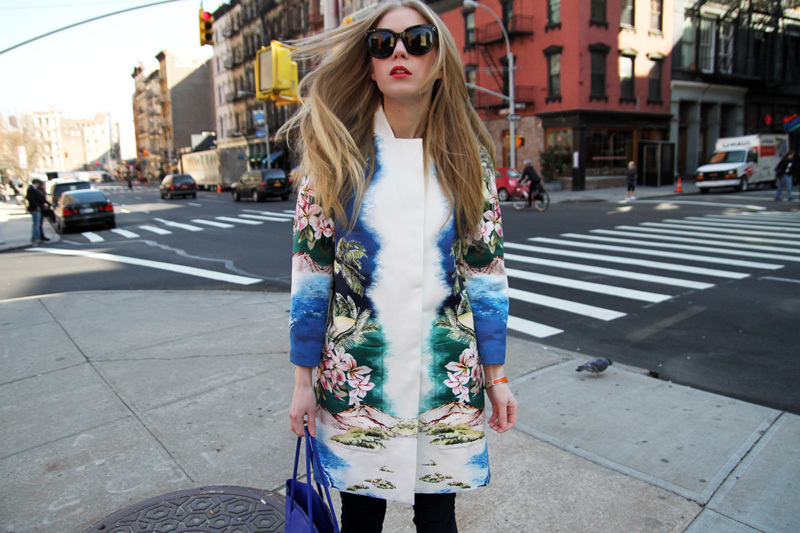 I really like that coat :) The print looks so cool and I love the combination with the electric blue purse !